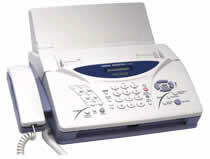 The IntelliFax-1270e is a full featured fax machine that addresses the basic fax applications of small offices. Incorporating a good mix of time saving features, it delivers reliable fax performance at an affordable price. * Generous paper handling capacities. A 200-sheet paper capacity and up to 20-page auto document feed are well mated to small office needs, reducing the time spent reloading paper and able to handle lengthier fax or copy originals. * 14.4K bps fax modem. Fax throughput is enhanced with a modem that can transmit as fast as 9 seconds per page and a QuickScan feature that lets you retrieve your original and get back to work while the document is transmitted. This page is part of GeneralManual.Com Network Brother IntelliFax-1270e Ribbon Transfer Fax User Manual.